Fish at this time of year can be challenging. We want comfort food to get us through the long dark cold nights but we also want to be healthy. I often turn to smoked fish at this time of year and I find spices always help. 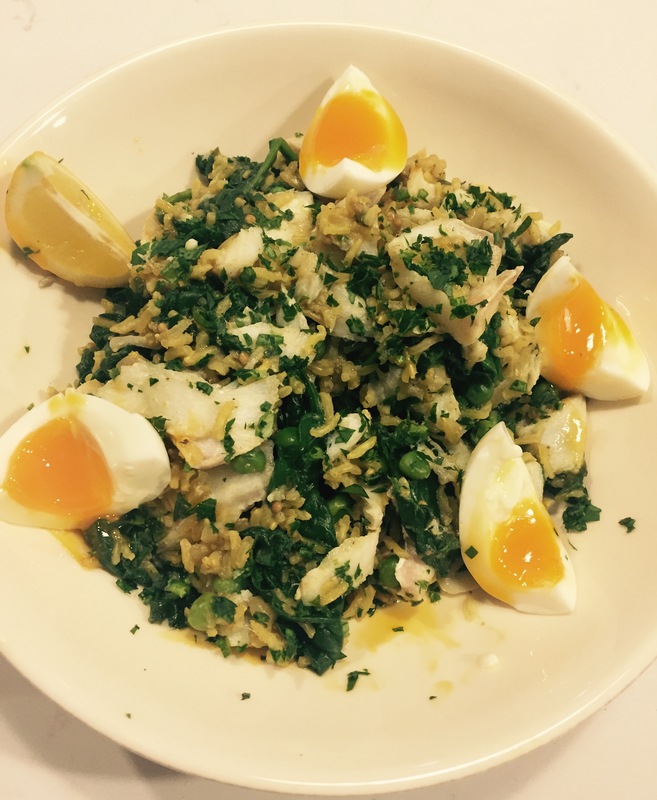 Kedgeree is a classic dish for this time of year - too good to save just for brunch. This brown rice and spinach kedgeree dish ticks all the boxes. Using brown rice and lots of spices makes it comforting and filling for a night in front of the fire, while spinach and peas give a hit of freshness to brighten the mood. A lovely runny boiled egg to mash into the rice and fish and I remember why this dish is such a classic. Kedgeree dates from the Victorian era when it was the fashionable breakfast dish of the middle classes. It is said to have its origins in an Indian dish called khichari which was a rather bland dish of rice and lentils that was typically served to infants and the infirm but also appealed to the rather spice shy Victorian Colonials stationed in India during the British Raj. Starting the tradition of Brits anglicising recipes for their own palate fish was added and the (to them) rather suspicious looking lentils dropped. Originally fresh rather than smoked fish was used and due to the lack of refrigeration fish tended to be eaten in the mornings – and that is why it is said kedgeree began to be served at breakfast time. Any breakfast dish can only be improved by the addition of an eggs and hence the classic kedgeree was born. It has certainly stood the test of time although now we are more likely to enjoy it at supper time than at breakfast. I find some recipes rather bland so I’ve upped the spice content and added chilli. If you don’t have all the spices listed in your cupboard I suggest just slightly increasing the amount of curry powder you use instead to say 2 teaspoons. If you don’t have or don’t like brown rice -white basmati is more traditional and has the other advantage of cooking much faster so reduce the cooking time to 10 mins with an extra 5 mins when you add the spinach. Place the haddock in a frying pan and just cover with boiling water from the kettle water. Return to the boil and simmer for 5 minutes turning the fish over half way through. Remove the fish to a plate and cover with foil to keep warm. Use the poaching liquid to make up your stock. Meanwhile place a little oil in a medium saucepan over a low to medium heat and add the onion and fry for 5 minutes. Then add the garlic, ginger and chilli. Cook for another 1 to 2 minutes and add all the spices. Cook through for 1 minute to release their flavours. Add the rice and stir through to ensure its coated with all the spices. Add the stock and bring to a simmer. Cover the pan with a lid and leave to simmer for 20 minutes. Check occasionally to ensure it doesn’t dry out. Meanwhile add the eggs to boiling water and simmer for 5 to 6 minutes. Drain and cover with cool water to cool the shell and prevent a black rim around the yolk, peel and quarter. Wash the spinach and add to the rice pan with the peas. Cover again and cook for 5 minutes. Skin the haddock and flake into largish pieces. Uncover the rice and stir the spinach through checking the rice is cooked and the water has been absorbed. Add the haddock and stir through to warm. Remove the cardamom husks. Serve in a bowl with the quartered eggs, some chopped parsley and some wedges of lemon.